My biggest issue with Brooklyn Nine-Nine continues to be how many episodes go by without the characters actually wanting much of anything. So “Det. Dave Majors” was a blast of barrelproof whiskey-scented fresh air with a delightfully fizzy orange-soda back. Part of the appeal of this intensely fast-paced and notably funny episode is the team-up between co-writers Gabe Liedman and Lakshmi Sundaram, who have consistently been the most eager of the show’s staff when it comes to taking advantage of the Brooklyn setting (they wrote the episodes centered around the artisanal chocolate-milk parlor and the potential arson at the pizzeria, respectively). For this go-round, they came up with another winner: a password-based underground bar called the Keychain, patronized by the titular Mr. Majors, the “blotter dynamite” NYPD detective whom Jake and Amy both idolize for his killer arrest and conviction rate. He’s played by Garret Dillahunt, a recent refugee of fellow Fox sitcom Raising Hope, who apparently has a rapidly aging painting of himself in his attic. Seriously, the guy is 50 years old and makes a credible romantic pairing for 32-year-old Melissa Fumero. I want his plastic surgeon’s number. Though Dillahunt doesn’t have much to offer here in the comedy department (he pretty much plays it straight gruff), his general “cool hot guy” vibe does make for decent competition on both the Jake-being-cool and the Jake-liking-Amy front, which electrifies the pair’s relationship on both professional and personal levels. Watching them compete to have the most CSI possible interaction with Majors is now one of my all-time favorite B99 scenes. (“I still have eight sunglass moods locked and loaded. In fact, make that nine, UHOY!”) In fact, the only thing I liked more than getting to see Andy Samberg drop his unsinkable-frat-boy shtick for a moment is getting to see him once again confide all of his romantic woes to Rosa, who is simultaneously the best and worst life coach in the history of time. (“There’s been so much build-up, you know?” he frets about the possibility of asking Amy out. Rosa: “No, not really. I don’t ask people out, I just tell them where we’re going.”) But while Jake gets a miracle reprieve when it comes to Amy turning down Majors, there’s yet another obstacle in the way: After her disastrous breakup with Teddy, she no longer wants to date cops. I’m guessing she’s going to conveniently change her mind approximately one season finale from now, but in the meantime, we’ll have to content ourselves with that adorable little Office-esque moment of her quietly double-tucking her hair behind her ears. My only disappointment with this episode is that the show once again introduced a really appealing possible conflict that I wish it could have parked on for more than one episode. Last week, it was Rosa’s unplanned (and ultimately nonexistent) pregnancy; this week, it was the possibility of Terry leaving and joining up with a private-security firm. Terry has every reason to potentially leave the precinct, which the show nicely enumerates: He’s got a third kid on the way, which means he needs more money, and he’s always been a family man, so obviously shorter hours would appeal. Even if his social conscience would have kept him at the precinct in the long run, did we really have to introduce and kill such a big potential plot shift in the same 22-minute episode? I mentioned this last week, but it’s really getting to the point where I feel like the show’s writing team is petrified of making any changes at all to the plot status quo. Terry could have left the precinct for Copperhead Security for a few episodes, maybe collaborated with his former colleagues on something that opened up B99’s world a little, and then returned to his old job with no harm done — just like Rosa could become a new mom without losing her essential badass nature. As someone who watches this show to enjoy the characters, not just the jokes, it would be really nice not to have everything be so incredibly stagnant. 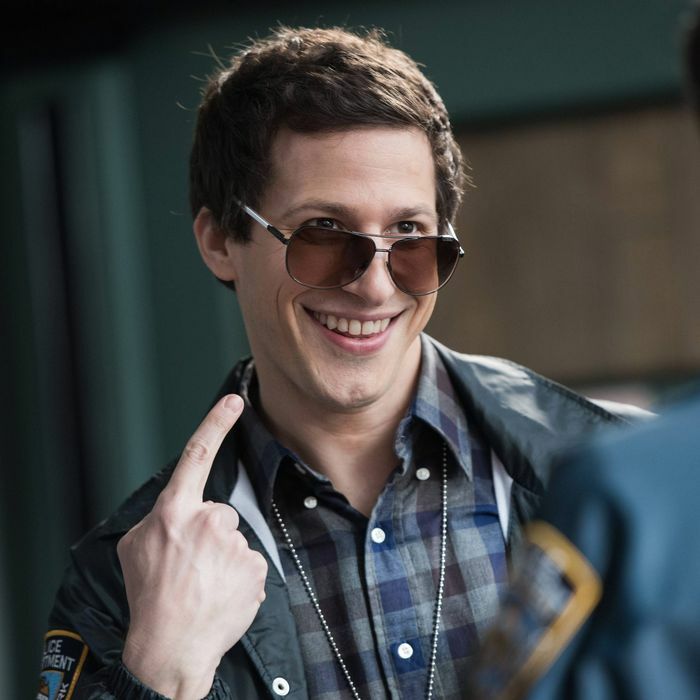 But while Brooklyn Nine-Nine seems to have gotten really good at introducing interesting new directions, like Jake and Amy themselves, I’m not convinced that it’s actually ready to pull the trigger on any of them. • Terry: “Do you know how much diapers cost?” Hitchcock: “Yes.” Hitchcock is really becoming the Creed Bratton of this show. • Terry loves walls. He also loves lavender.